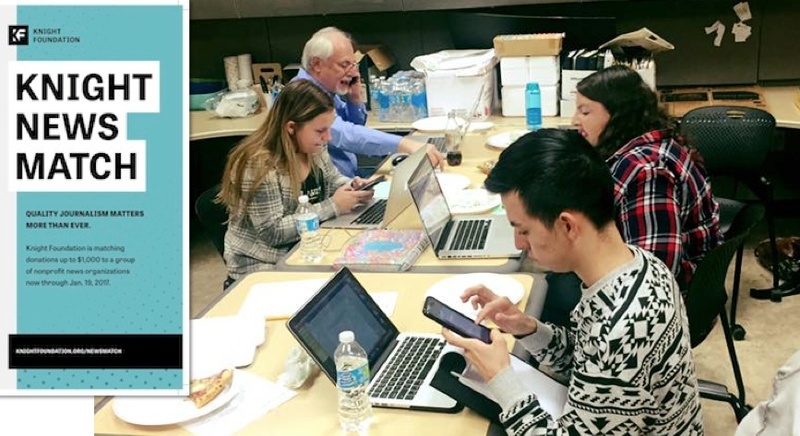 Being one of 57 news organizations nationwide selected for the Knight News Match has given us plenty of reason to reach out to you and to tell our story. To the 61 people, including two of you who donated twice, and businesses supporting our work through the News Match that doubled their IowaWatch gifts we say a sincere thank you. We also thank another 23 of you who donated to our #GivingTuesday campaign in December before we knew about the News Match. Today (Thursday, Jan. 19) is the last day you can take advantage of the Knight News Match. Every $10 you donate becomes $20 for IowaWatch because of the Knight Foundation’s generosity and designation of IowaWatch as a worthy non-profit news organization. If you have not donated already, please join our growing list of supporters now before the match offer expires tomorrow night. So far, you had helped us raise a little more than $14,770 total, $9,270 of which the Knight Foundation will match under its guideline of doubling each donation up to $1,000 per individual and $25,000 total for IowaWatch. Your response has been impressive, given that we will be only seven years old in a few weeks. We are happy to have new friends and supporters who care about in-depth, fact-based investigative and community affairs journalism but also the training we give young journalists to do this kind of reporting at a high, ethical level. 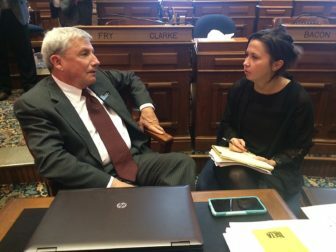 IowaWatch intern Krista Johnson, a University of Iowa senior journalism student, interviews Iowa state Rep. Andy McKean, R-Anamosa, on Jan. 10, 2017, on the Iowa House floor. Your donation supports a news organization that shared 46 stories in 2016 that were republished or aired 1,223 times by 103 newspapers, radio and television stations and websites. IowaWatch stories were the basis for 85 other stories, editorials or guest opinions published or aired by our media partners last year. We like telling you the following, as well: Former IowaWatch interns have jobs in places that include The Des Moines Register, Iowa City Press-Citizen, The Gazette (Cedar Rapids, IA), Charles City Press, Rapid City Journal, Iowa Public Radio, iPhone Life Magazine, InjusticeWatch.org, Portage Daily Register, China Daily News, WUSA9, WHO-TV, WALA Fox 10, CFE Media, Ogilvy Public Relations, the University of Missouri School of Journalism and GameTrailers.com/. Donations written by check and mailed by Jan. 19 still count so we won’t have a final amount raised until next week. If you want to mail a check to IowaWatch, our address is P.O. Box 2178; Iowa City, IA 52244-2178. Thank you, everyone, for supporting IowaWatch. On October 3, The Iowa Center for Public Affairs Journalism-IowaWatch.org and Iowa Newspaper Association will host the first of what organizers hope will be an annual banquet that brings attention to the need of a free press and open government in our democracy. 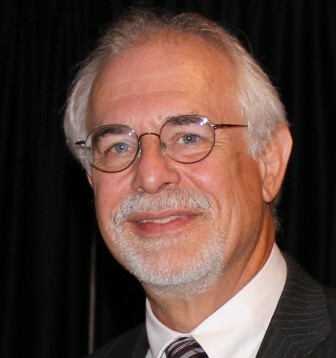 The banquet will feature guest speaker Andy Hall, executive director of the Wisconsin Center for Investigative Journalism, and the inaugural giving of awards to two people who have had a signi?cant impact on promoting open government and the notion of a free press in Iowa.